Ahhhh... It's been a while since I've been on the forums, new update with my female panther and my male panther they mated two days ago... I had a couple questions i couldn't exactly get an answer on... So first, they mated only once for about an hour, but I did read they may do it more than once, but she didn't want anymore... so they still have to go again? Second, about how long until the female is ready to lay her eggs? Lastly, this isn't a question BUT I am going to be posting pictures and also pictures of the babies due to the fact my female is from petco and I am unsure of her locale, and I'd like to know what you guys think the locale mix of the babies are. 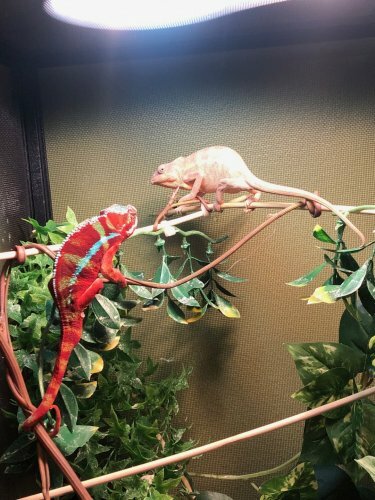 My male is a rbrb ambilobe. Great looking male! Love that red color. Not judging, but if it were me I think I would have to get a good lineage female to go with that bad boy. That being said, I wish you luck with your project. Much can be learned by going through the process. As to your questions, one round of mating can indeed be productive, and I feel that if one or the other isn't interested in more that it's not worth stressing them out by leaving them together once one party wants to be done. As for how long after a mating will it take for eggs...that is going to depend on several factors: The age of the female, her size, diet, health, supplement schedule, the list goes on and on. As a general rule, it can take as little as a month if she is already at the egg laying stage, and it could take several months if she isn't ready. The good news is that she can store the sperm for up to 6 months and use it to fertilize 2-3 clutches. Most female Panthers only have around 6 clutches in their entire life, so they only need to breed twice. The down side of this, from a pet perspective, is that if they start pumping out clutches every 2 months, their lifespan is majorly shortened. Regardless, best of luck and I hope you get some of that great red color to pass on to the progeny! Beautiful colors on that guy! I would love to get a red one next. Ah yes! Thank you guys so much! I really do some of those babies get that amazing red passed down, I guess it might be a bit of a mystery... Again, thank you so much for the information Redman that was definitely needed and helped fill in those couple holes I had questions on! beautiful pair, best of luck breeding!!! @bloftis1 , sorry to side track here, can you pm a couple of his pics that you don't mind me using as a sibling pics for the two sisters of him I have? He's turned out pretty nice man. As to the topic, @Redman already nailed it. Ah yah perfect I will! Try replying to the one I just sent you. Hopefully that'll work lol.